We are going on a trip to the 60s, 70s and 80s! There will be a looped screening of original Super8 travel films, films that depict of important events, and more personal footage of day to day life. You can look forward to a film of people with red hair on a day out, beautiful images of a beach dating from the end of the 70s, scenes from the Russian Sate Circus, images shot on the streets of New York at the beginning of the 80s, an ordinary birthday film from Haarlem in the 60s. And there will be fiction films as well. Because people actually wrote scripts and shot lists, shot the footage and edited it by hand! Next to the screenings of the original material, there will be digital screenings with performances by modern day artists. They will interpret the original films, and use new layers of sound and music to create a dialogue between the then and the now. 19:00 – 21:00 Films installation Ester Eva Damen, who uses Super8 films not only in solo shows but also in a wide range of collaborations with dancers, choregraphs, composers and musicians. 20:15 – 21:15 Prolific and long time experimental filmmaker Jaap Pieters aka « The Eye of Amsterdam » is flying in from Schwarzwald especially for the festival! With an extreme alertness to the day to day things happening around him, Pieters creates portraits or documents of small events that are usually not longer than one Super8 cassette. Pieters is an advocate of analogue film and never uses digital techniques. He will screen a selection of his own works. It was special when you were filmed with a Super8 camera. Super8 was something luxurious, it was a sensation. Subjects were aware of the camera, but they didn’t take any selfies, nor did they treat the camera with the self-assurance we feel today when someone points the lens of a smartphone at us. They respected this new medium and were often a bit shy, but flattered that they were chosen to be put on tape. Because the material itself was expensive, every centimeter counted and had to be filled with memorable events or beautiful landscapes. When Super8 was born, film was not just for the big screens or the television anymore, it permeated the living room in the form of the home movie. Film clubs came into being for amateur filmmakers that shot movies with love and care for the technique and the material. Contrary to how movies shot with phones are being shared and viewed nowadays, watching Super8 was something intimate, just as intimate as the act of filming of friends and family was. Let us take you back to a world with no Facebook, phones or YouTube on Super8 Filmfestival. 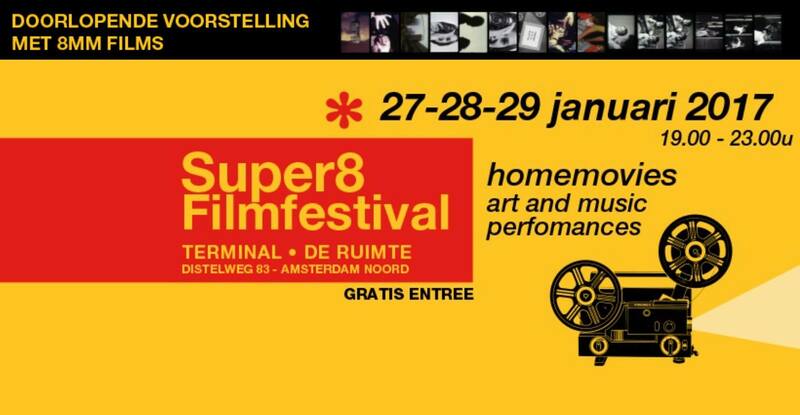 Enjoy the glory of Super8!